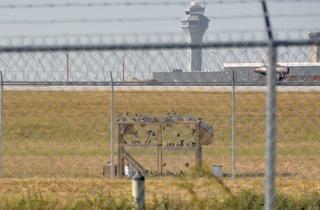 Bird cage at O’Hare | What’s up with that? Worldwide icon-chevron-right North America icon-chevron-right United States icon-chevron-right Illinois icon-chevron-right Chicago icon-chevron-right Bird cage at O’Hare | What’s up with that? USDA Wildlife Services tries to keep the feathers from flying at the international airport. The apparent bird jail is a trap used by USDA Wildlife Services to collect European starlings. Since the fall of 2011, the USDA has been catching and killing the invasive species to protect aircraft and save lives at O’Hare. Between 1990 and 2010, the Federal Aviation Administration reports, planes hit 121,000 wildlife (97.5 percent of which were birds) nationwide, causing 23 human deaths and 257 injuries. The FAA estimates these “wildlife strikes” cost the commercial airline industry $123 million annually, but since 80 percent of strikes aren’t reported, it says the toll could be closer to $614 million. In addition to two 1994 incidents in which planes collided with coyotes, O’Hare has had its fair share of avian run-ins. In September 2004, the engine of an American Airlines jet carrying 107 passengers ingested six migrating double-crested cormorants after leaving O’Hare. The engine combusted, but the pilot was able to make an emergency landing. In February, shortly after takeoff at O’Hare, a United Airlines pilot decided to turn back after striking a bird. 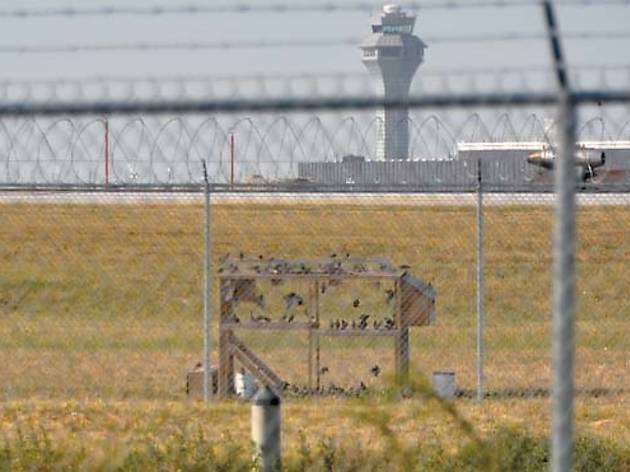 As for the fate of the caged starlings, Chicago Department of Aviation spokeswoman Karen Pride says “relocation is not an option.” Wildlife Services euthanizes the birds following American Veterinary Medical Association guidelines.